Benedict XVI (Latin: Benedictus XVI; born Joseph Aloisius Ratzinger on 16 April 1927) is Pope Emeritus of the Catholic Church, having served as Pope from 2005 to 2013. In that position, he was both the leader of the Catholic Church and sovereign of the Vatican City State. Benedict was elected on 19 April 2005 in a papal conclave following the death of Pope John Paul II, celebrated his papal inauguration Mass on 24 April 2005, and took possession of his cathedral, the Archbasilica of St. John Lateran, on 7 May 2005. Pope Benedict XVI's book Holy Days: Meditations on the Feasts, Fasts, and Other Solemnities of the Church was available from LibraryThing Early Reviewers. Pope Benedict XVI is currently considered a "single author." If one or more works are by a distinct, homonymous authors, go ahead and split the author. 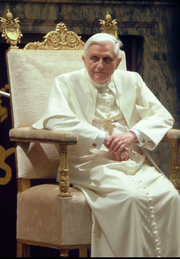 Pope Benedict XVI is composed of 167 names. You can examine and separate out names.